I started the spring season with two goals, one: see more bears than I had ever seen in a spring season, and two: kill a spring bear with my bow. Goal one would be easy. I had been working hard to get ready for the spring season. Talking with good friends about how they bear hunt and how to find more bears along the way. I had also been working hard making sure my new Hoyt bow was up to the task at hand. Bear number one of the year. The season got off to a bang when good friend Brain Barney and I spotted a huge boar five minutes into our first glassing session. The hunt was on! I bailed off 1500 vertical feet of steep hill crossed the river and made my way up the other side. 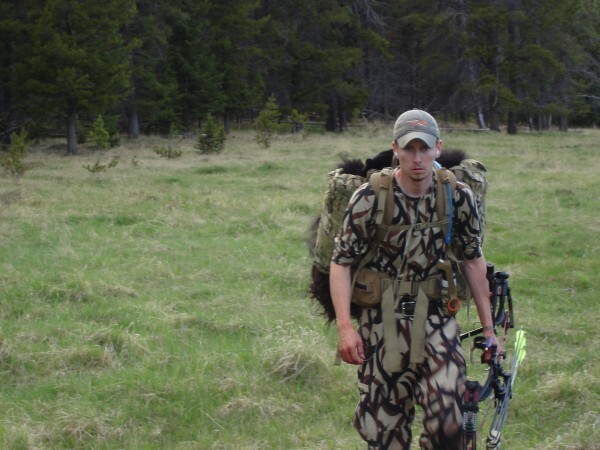 After a very steep climb my stock was cut short by some very fickle wind, my first hard learned lesson of bear hunting. Bears have a nose that makes an elk look like he has no sense of smell at all! If you don’t have the wind right you might as well not even try it. You will be done before you even get started. Another evening spent locating spring black bear. The next day another good friend of mine made it closer than I did to the big boar, but was also unsuccessful. For the next week we tried to locate the big bear but were unable to find him again. 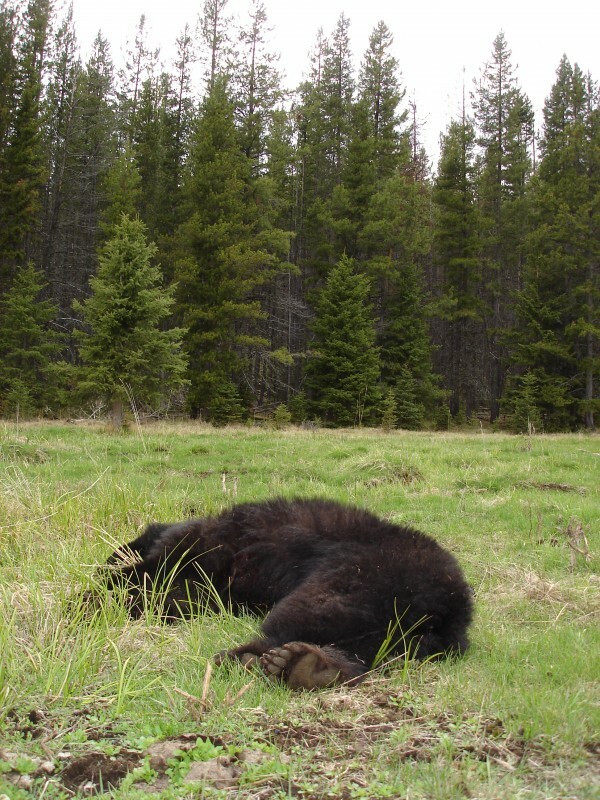 Food is key for bears in the spring; without good food bears will not stay long in an area. After not finding the big boar for the next five days, we were sure he left the area in search of better food. Chocolate soe. not what I want but nice to have around to watch and learn from. For the next couple of weeks, bears were few and far between. Spring turned back into winter. 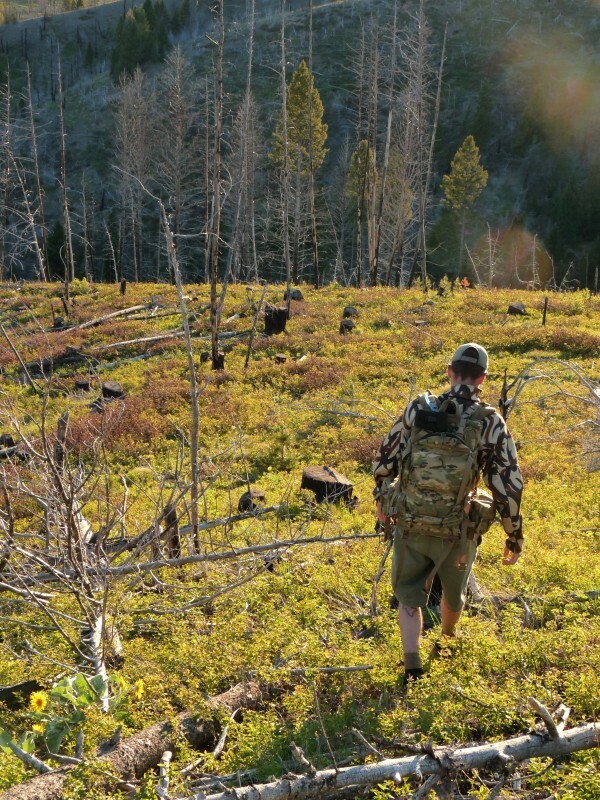 Foul weather and low bear numbers made it hard to stay focused. It was only about a week later that I ran into friend Steve Drake of Mystery Ranch. He was also having a rough spring chasing spring turkeys. So we decided to team up and see if we couldn’t figure this bear thing out. 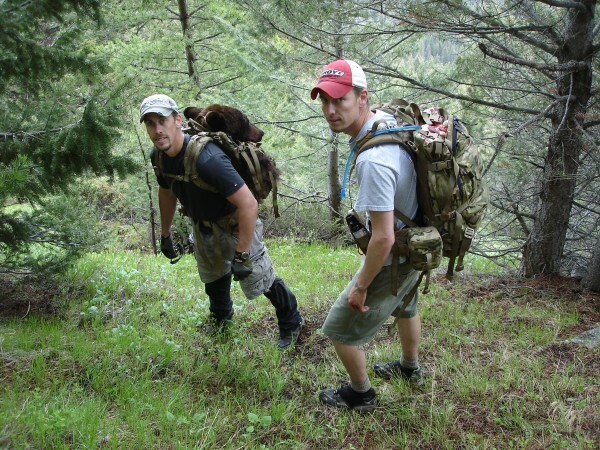 After a couple map sessions and a few conversations with other bear hunters we had a solid game plan. As Steve and I walked to our first glassing spot, I could only wonder if this season would just be like all the rest. Within five minutes of being there my question was answered. Bears spotted – an awesome chocolate sow with a cub. Even though the sighting was short it gave me new hope for the season. 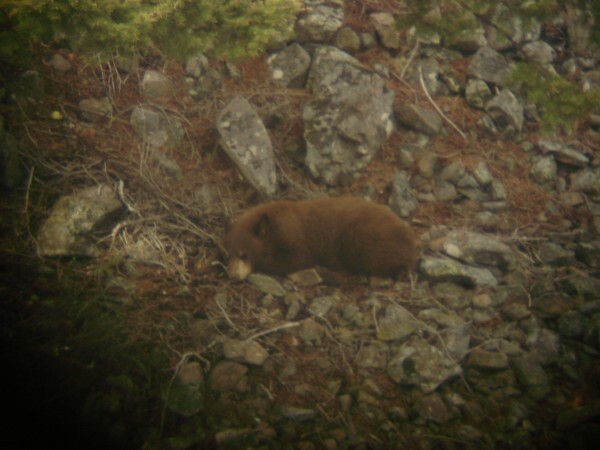 Good thing film cameras are a thing of the past, because I would have burned a lot of film taking pictures of bears through my spotting scope! About a week into our tag team assault on the bears I had to make a trip to Billings for work. I knew Steve would be heading into our bear rich area. As I sat in an afternoon meeting my phone started to ring. Guess who? 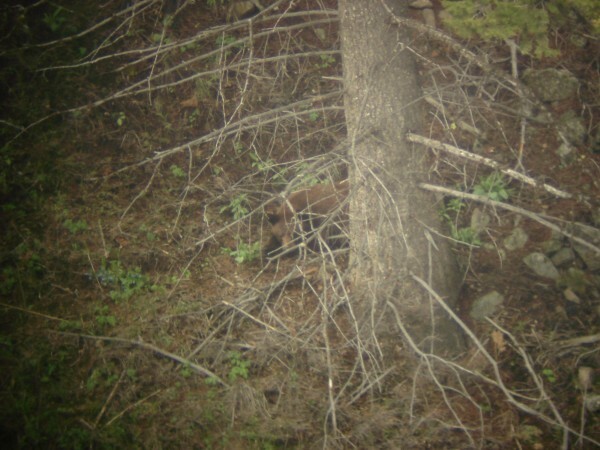 Steve was calling to inform me that he had connected on his first Montana bear! I wish I could have seen the look on his face. Everyone in the meeting could tell he was pumped, from the excited yelling coming over my phone! I was bummed I could not help Steve get his bear out, but was confident that he would have no troubles. The Crew Cab is the best way off the mountain. With Steve’s bear in the bag I started looking in other areas to see if we could take our new found knowledge of bears and apply it to other parts of the state. A long weekend trip found myself and good friend Karl Dagel, sitting behind the big glass doing what we do best. Karl was dumbfounded we found so many bears that close to town. Karl, is from an area that is better known as bear central. He was positive we would be on bears from the word go. He was right. My bear before the stalk. First night out I found myself with my boots and socks off wading the river on the stalk of what I hoped would be my first bear with a bow. If I learned nothing else from the spring season, it is that bears have a sense of smell that will put about any animal to shame. Don’t even attempt a stalk unless the wind is perfect. You will get busted! Once on the other side of the river I worked my way into the trees not long after I spotted the all black bear feeding in the chronic green grass. The bear fed in every direction, never stopping for more than a brief second to get another mouth full of grass. I slowly worked in until I was at the end of the trees. I gave myself a “calm down, you got this” pep talk. 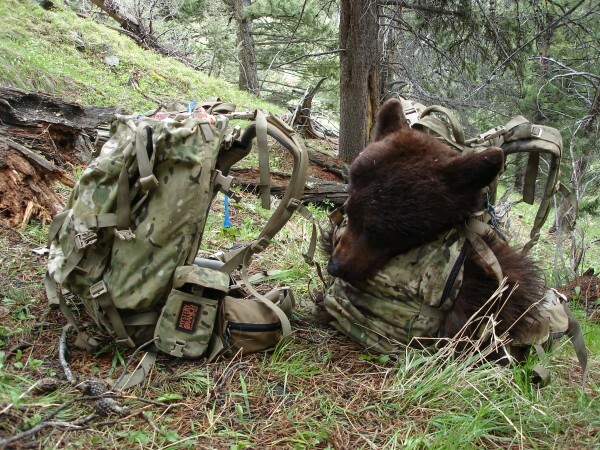 As I waited for my chance to loose an arrow the bear continued to do everything in its power not to give me a shot. A couple minutes went by when the bear stopped perfectly broadside. It was really working a chewing – almost like it had got too much in its mouth to swallow. One more click of the rangefinder to make sure, and I came to full draw. My first bow kill bear! When the shot broke it surprised me, but where the pin was when it did could mean nothing but a bad day for Mr. bear. I watched as my arrow arched into his jet black coat. The bear jumped, let out a loud grunt and took off running right at me. Oh hell this is not good. I quickly loaded another arrow. 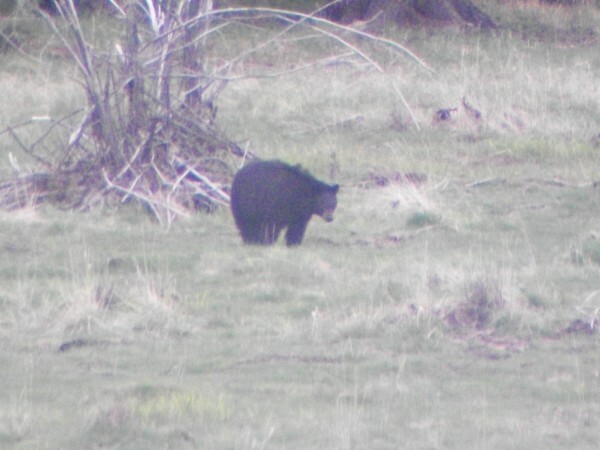 But when I looked out from behind my shooting tree the bear was waded up in a pile a mere 13 yards from where he was hit! I couldn’t help myself, after I realized the bear was stone dead, I did a little end zone dance! From across the river I could hear Karl yelling his approval! 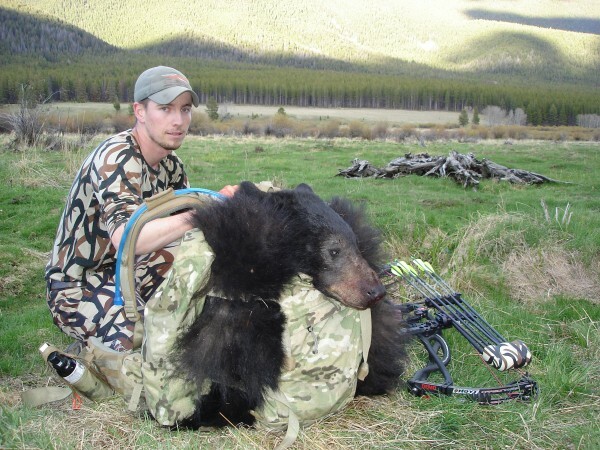 My first bow kill bear – I couldn’t be happier. Packed and ready for the hike out. 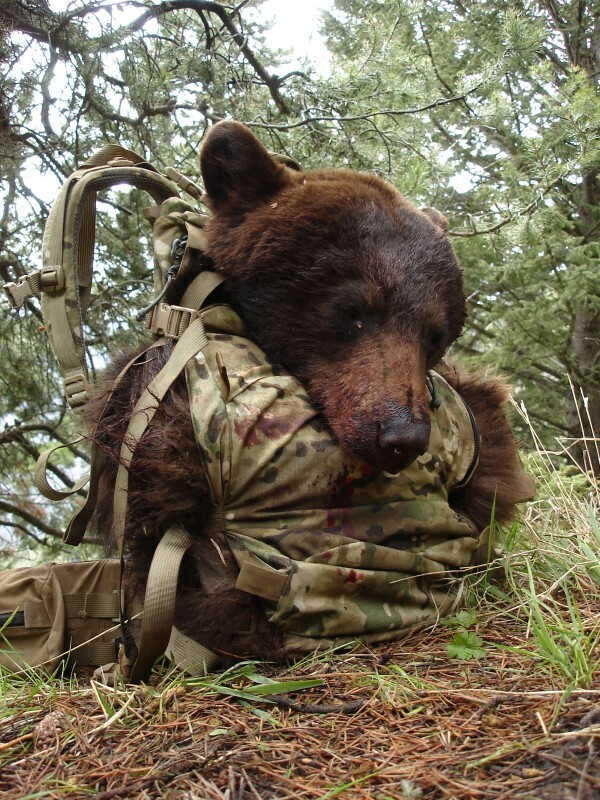 Now came the fun part: Pictures, skinning, quartering, and loading the whole bear into my Mystery Ranch Crew Cab! Even Karl could not believe how well the pack rode with such a load in it. Some good tunes make the hike out that much faster. Even though my season was over it did not stop me from going out and still trying to learn as much as I could about bears in southwest Montana. 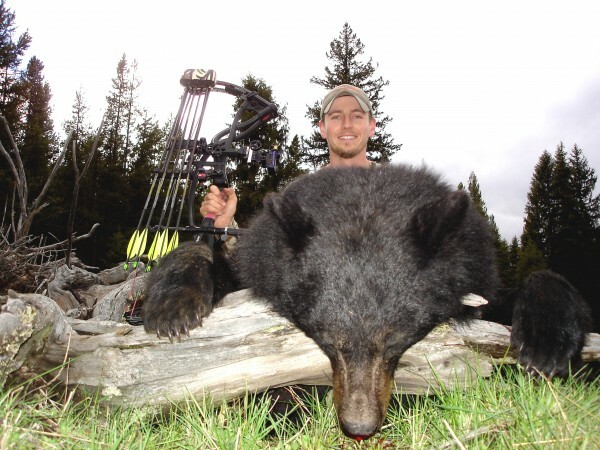 Good friend and owner of Big Sky Archery, Gabe Roffe, still had yet to pull the trigger on a bear. He was more than happy to have the big glass picking the hills apart alongside him. On the first night Gabe and I went out, we saw seven bears. The next night we saw four – all different bears. Night three I watched as Gabe made a play on a very big boar. Problem was, as good as our hand signals were, they were tough to see them at almost 2000 yards. 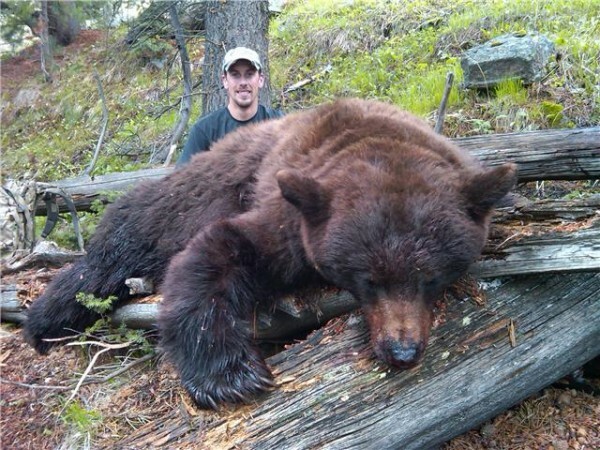 Even though Gabe, was unable to put eyes on the monster black bear, he was still sure he could find a good bear before the season ended. Gabe with his last minute spring bear. On June 15 at 10:45 pm I got a text from Gabe, “You still up?” Gabe usually won’t call me unless he really needs help packing something out. From the sound of it, it was more than a one man job. Double Crewcabs ready for the long walk out. Early the next morning found Gabe and I a long way from the truck. 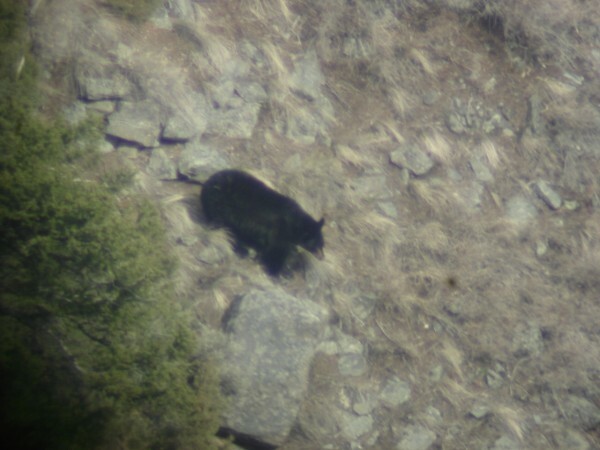 As we made our way up to the top of the mountain the unmistakable shape of a very large bruin came into focus. With an hour to go in the season Gabe had managed to not only make it up to the top of the mountain, but manage to find his quarry in the fading light. The on again off again rain storms made pictures and skinning a bit more wet that I prefer, but we got it taken care of in short order. With double Crew Cabs filled to capacity it was nothing more than a scenic hike back down the mountain. The end to what has been the best bear spring of my life. This spring season was as fun as any I have been a part of. My total count for the year was one animal short of 20 bears. It would not have been nearly as easy to continue to push myself to go, if not for the company of good friends and an iPod playlist or two. I hope to add ten bears to my “seen it” list next year. Next spring, come rain, snow, or shine, you can bet I will be out picking the hills apart with the big glass.